Having Hollywood stars as your guests will undoubtedly make your birthday a very memorable one. Tim Yap was fortunate enough to have British actress Rachel Weisz and American actor Jeremy Renner as guests for his birthday party held recently. The Bourne Legacy stars are currently in Manila to shoot scenes for the Hollywood spy thriller. 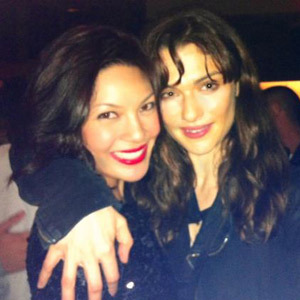 On January 17, Tim Yap posted this update on his Twitter account: "First hour of my birthday last night was spent getting to know Rachel Weisz. What a down-to-earth, intellectual soul!" When he was asked if Jeremy Renner was present during the party, the TV host answered, "He was there too but I didn’t get to really chat with him as I was more fascinated by Rachel’s presence :-)"
On that same night, photographer Mark Nicdao also uploaded a photo of KC Concepcion through the microblogging site. In the photo (shown above) shared publicly through Twitter, it can be seen that Rachel has her arm around KC’s shoulders. Meanwhile, Iza Calzado used the microblogging site to express her excitement over meeting the two Hollywood stars. She published this in her Twitter account: "Aaaaaaaahhhhhhhh I just met Rachel Weisz and Jeremy Renner!!!!!! I love Rachel. Parang sasabog Ang puso Ko #fanmode"
In an interview with GMA News, Iza admitted: "I was so honored to be in her presence. Madali talaga akong ma-starstruck, hindi n’yo lang alam. I was just in awe. Garlic Garcia, another guest present during the event, shared a photo of Tim seated beside Rachel as they blew on a cake slice. She provided this as the caption of the said photo: "Happy Bday to our beloved @officialTIMYAP blowing his bday cake w/ no less than THE RACHEL WEISZ! Love you!" FILIPINOS IN THE BOURNE LEGACY. Based on the website of the Metropolitan Manila Development Authority, the cast and crew of The Bourne Legacy are expected to shoot in the Philippines until February 2012. There will also be crucial scenes to be shot in El Nido, Palawan. According to a report of GMA News, there are several Filipino actors who will be part of this international film. The said report quoted Lou Veloso as saying that auditions for the movie took place in September 2011. Aside from Lou, John Arcilla will also be part of the fourth installment of the Bourne franchise. Veteran performers Madeleine Nicolas, Ermie Concepcion, and Lilia Cuntapay also succeeded in passing the auditions for the cast. The 76-year-old actress, Lilia Cuntapay, is best known as an extra in local horror flicks. She was hailed as Best Actress during the 7th Cinema One Originals for the indie film Six Degrees of Separation from Lilia Cuntapay.